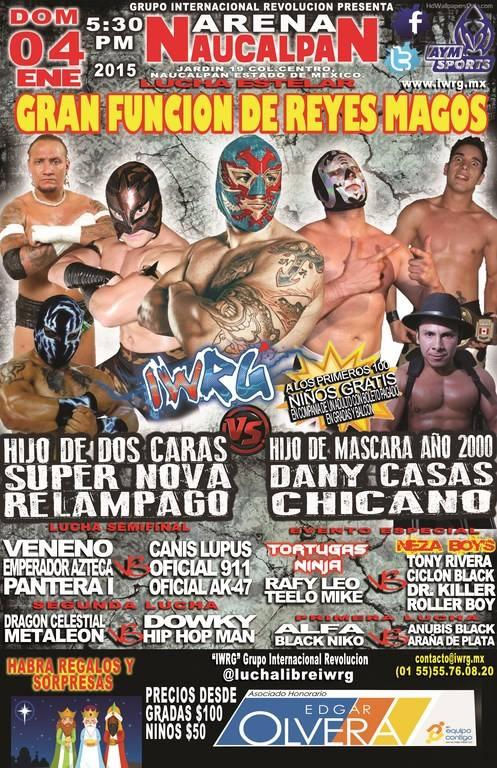 Freyser, seen last week on an ex-IWRG team, returned here to replace Arana de Plata. Straight fall win for the rudos. straight fall win for the Chicano team. Recap teases Canis/Eterno vs Chicano/Danny. Monsther (II?) 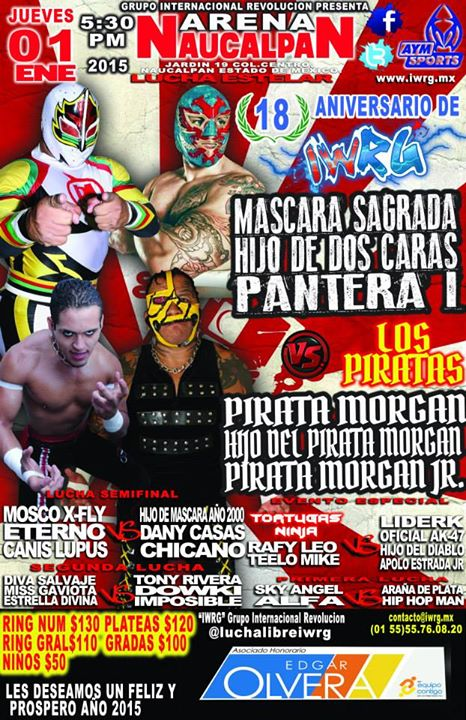 replaced Pirata Morgan Jr. Tecnicos took 2/3, with Sagrada sneaking in a revenge foul on Pirata. That's the feud, but Sagrada also asked for a trios title match with this team vs the Piratas. Eterno was watching the show from the crowd. Tecnicos took fall 1, after Danny accidentally hit Eterno after a dive. After a series of dives, Chicano was left alone in the ring (refs went to check out people), and Eterno decided to run in and give Danny Casas a martinete. Eterno fled the scene of the crime, Mascara & Chicano returned to the ring and were baffled as to what happened to Danny Casas. Danny was stretchered out, and the tecnicos took advantage to tie the match. Mascara fouled Dos in the third. Roller Boy's name has changed apparently changed. Suicida replaced Dr. Killer. Turtles won again, but Neza Boys vowed to unmasked the turtles. Chicano won in straight falls in a match where both bled a lot and continued to fight after the finish. Estrellas del Ring bills Eterno as a "ex-member of Anarquia AAA". 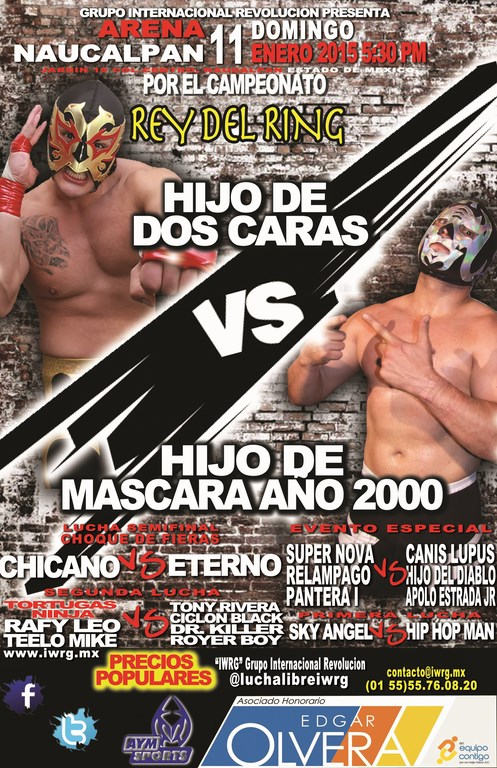 Mascara took 1/3, the last when Universo 2000 Jr. snuck in and hit Dos Caras with a chair. Dos Caras falls on first defense. Leo beat Impossible and asked for a title shot. Rayan and the Oficials had problems leading to their loss. Rayan declared the truce been the Oficials and Comando Elite over and demanded a trios match. 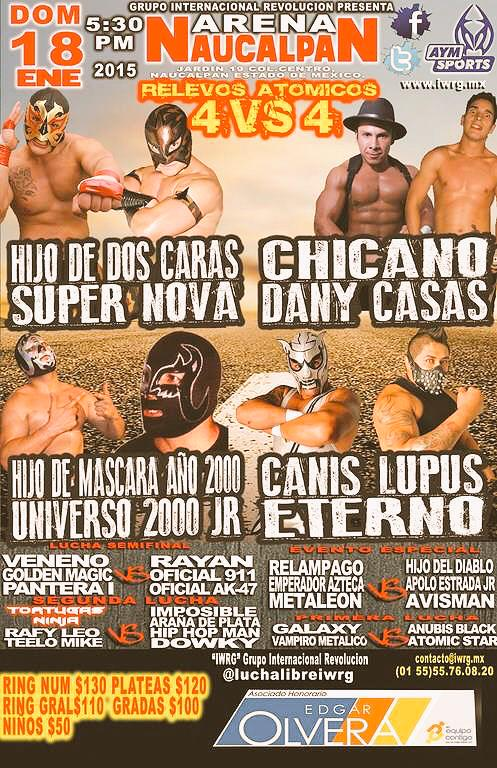 Appeared to be a four way tag on the poster, but it also said it was an atomicos. Turned into a bloody street fight by the second fall. Straight falls, with Chicano & Danny besting Canis & Eterno and demanding a tag title match. This turned into them having a mask/hair vs hair/hair if Chicano & Casas lost the title match. 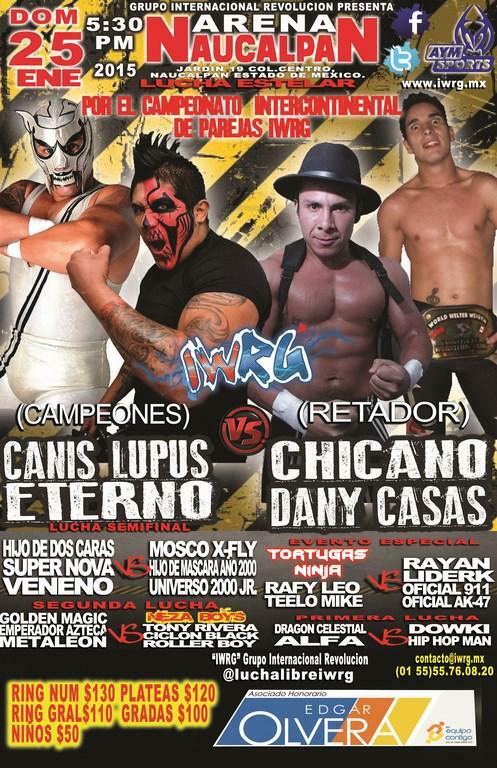 Muerte Infernal replaces Fly Boricua. Gym FILL (Black Terry) vs Gym Metropolitano (Super Pinocho). Match ended with Metaleon losing to Super Pinocho 3000 by DQ. Anubis Black replaced Dowki. Hip Hop Man wants a rematch against Dragon Celestial for his Argentino championship. Leo was stretchered out after a moonsault onto AK-47. Turtles won anyway and Oficial/Comando Elite fought after their loss. Mascara was beat in the third, came back to hit Dos with a chair, and was eventaully caught. Challengers Chicano & Danny Casas took falls 2/3 to take the titles. Lupis & Eterno fall in first defense. 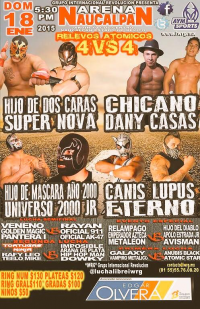 Third fall saw Eterno beat Danny, Chicano beat Canis, and Chicano surprise Eterno with a casita to win. Eterno & Lupus demanded a hair match with the new champions, then both teams fought until the locker room cleared out to seperate them.